How to access to Cat Ba?From Hanoi, there are two ways to get to Cat Ba Island: via Hai Phong or Halong. The private vehicle such as a car is a good option as the route from Hanoi to the two cities are smooth, especially the expressway Hanoi – Hai Phong is finished since 2017, that helps to reduce the transfer time significantly. However, to bring your car to Cat Ba Island it would take a long time to wait at the harbor so as to get on the ferry. Still, transferring by sharing bus/van to the harbor and then transfer by speedboat to the island is more preferable. The earliest bus departs from Hanoi at 5.20 and the latest one of the day departs at 14.30. The bus is quite clean and comfortable with AC equipped, towels and water on the coach and sometimes snacks are provided. Ticket ranges in between $8-20$ per pax per way with the speedboat/ferry included. The four most famous transfer brand that offers the bus and speedboat/ferry services are Cat Ba Express, Goodmorning Cat Ba, Daiichi Travel and Hoang Long. Each provider has a different schedule. 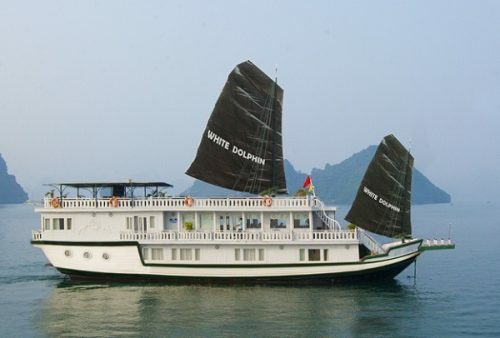 This route is for the ones who want to visit both Halong Bay tour and Cat Ba Island. Combine one night staying and visiting Halong City or some sightseeings in Halong Bay is recommended. You can transfer from Hanoi to Tuan Chau Island, then buy the ferry ticket from Tuan Chau to Gia Luan Harbor in Cat Ba Island. Continue to catch the bus to get into the center of Cat Ba Town. This itinerary is more preferable by the domestic guests in a big group and suggested to be booked via professional travel agents. Cat Ba town is where you can find many options to stay. There are not many choices if you are looking for a luxury property. Still, there are some good resorts such as the Cat Ba Sunrise Resort, Cat Ba Island Resort & Spa. The other hotels are mostly basic 3-star standard or hostels. Le Pont Bungalow hostel is a lovely choice with small rooms or bungalow but has a great view. Staying near the town is convenient but if you would like to stay away from the busy crowd, there are some options near the Cat Ba national park such as the Cat Ba Mountain View, the Little Cat Ba Hotel, Cat Ba Ecolodge, or choose to get off the beaten track in the small island with the Cat Ba Sandy Beach Resort or the Monkey Island Resort. The availability of the hotels in summer (from May to September – considered as the high season traveling on the island) and in the weekend is quickly out of the stock. It is highly recommended booking in advance. Swimming and relaxing on the beach. There are 3 beaches just take about 15 minutes walking or a few minutes transferring by the electric car from the center of the town: Cat Co 1, Cat Co 2 and Cat Co 3. The beaches are small but the emerald water is great to swim. The Cat Dua 1 and Cat Dua 2 beaches on the Monkey Island are also beloved by the swimmers. To get in the Monkey Island you have to hire a boat or book a tour with the local providers. Taking a boat from Beo Harbor near the town then you get in the Monkey Island (known as the Cat Dua Island). You can choose to join in a diving tour at Diving Center in Monkey Island Resort to see the beautiful corals and rare sea creatures. Hiring a kayak and you will be free to sail on the emerald crystal water while enjoying the beautiful scenery of thousand lime karsts on the Lan Ha Bay. This activity is dedicated to the ones who would like to experience the venture and challenge themselves. Stretching your body to conquer the craggy islet. Up to the certain high, you can drop yourself off to the crystal water and all the weariness, hot and sweat will be dissolved in the water. This is not an easy trek but the great view from the top is definitely worth your time to try. On the way in the jungle, there are various of weird plants and animals that hardly found in other places. It is highly recommended to start your trek latest at 3 pm because the jungle becomes dark quickly. When doing the trekking, bringing water and applying insect repellent are essential. Cat Ba island offers many interesting dishes from seafood such as the grilled geoduck, deep-fried mantis shrimp, boiled crab or stir-fried squid. All the ingredients are fresh and cooked tasty by the local recipes, great to combine with the cold beer. It is easy to find many restaurants in the center of town. With all the beautiful and interest things that the Cat Ba Island offers, it is worth to spend a couple of days to visit along with the other wonderful sightseeing in Vietnam.